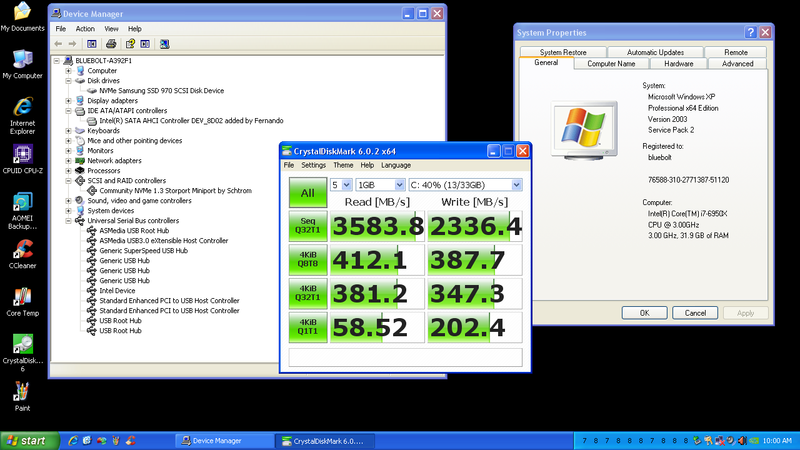 I installed the Windows XP Professional x64 operating system on a Samsung 970 Pro NVME SSD drive using an ASRock X99 Extreme4 motherboard. Really easy the second time. Use diskpart in Windows 7 x64 to create the aligned partition on, and format, the NVMe drive (the Windows 7 OS must have an NVMe driver installed, or diskpart will not be able to see the NVMe drive). Use Device Manager in XP x64 to install Schtrom's driver, which makes the NVMe SSD available as a storage drive -- and the XP x64 operating system as such now includes the NVMe driver. Run the storport hotfix. Use AOMEI Backupper to clone the XP x64 disk to the NVMe disk (remember to align the partition). Reboot into the BIOS and set the NVMe drive to boot first. I don't know whether Kai Schtrom had Windows XP 64-bit in mind when he wrote his driver, but for those of you running that OS it does present the potential for significant performance improvement, to say the least. I'm currently working to overhaul my desktop machine, which uses XP64. 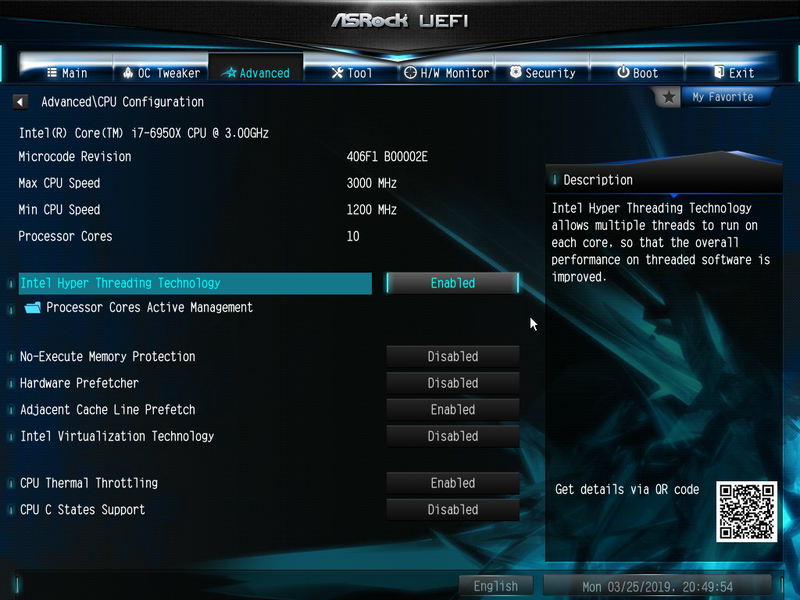 I've got an ASUS SABERTOOTH TUF X99 mobo I'll be using and apparently it can support NVMe SSDs, although I do see one person saying that the drives get zero airflow and heat up to 80 C / 176 F when using the mobo's native connection, which ... does not sound ideal. Will this driver work with the SABERTOOTH X99s? Also, what would you recommend in order to TRIM? We have a thread on that for XP32, but I don't know if what software would be recommended for XP64, especially for this type of SSD. I've only used SATA III Intel SSDs and the Intel SSD Toolbox, so this is new to me. 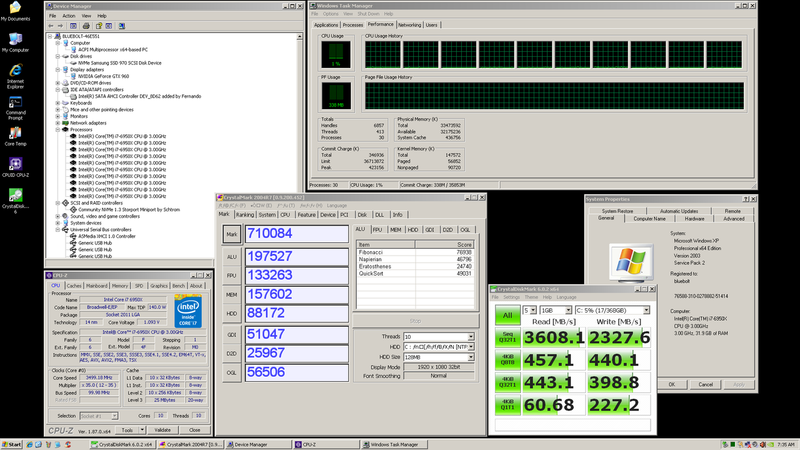 Schtrom tested on a Samsung, so I thought it the best chance for success, and the 970 Pro very fast for the price. After booting and running fine initially, I turned mine on yesterday and waited 20 minutes for the desktop, with the system barely moving after that. And when I say barely moving, I mean glacial, which is frustrating because of the time it will take to work things out...half the morning today just to check Task Manager, Event Viewer and such. I've tried some things outside of Windows, such as running the clone process over again, but so far that first time was the charm. First off, in Event Viewer neither /Application nor /System showed any problems (except for the expected hangs owing to the molasses-in-wintertime mode the machine was "running" in). Task Manager showed the usual System Idle Process 99. I ran CrystalDiskMark, which took a very long time -- I expected terrible readings, but instead the top-line read and write marks were 1607/2325. In other words, the read mark was about half-speed, and the write mark was up to spec. Based on that, the machine should still have been lightning fast. For some reason the half-speed mark made me think of hyper-threading, so I turned off hyper-threading in the BIOS -- and the machine booted up and ran normally. The internet said if you don't install Server 2003 with hyper-threading turned on, it won't run right if you turn it on after the fact. I never knew of such a thing. This is really my Windows 2000 Professional machine (where I don't use hyper-threading), so I think I had hyper-threading off when I installed XP x64, then enabled it later without realizing the consequences. 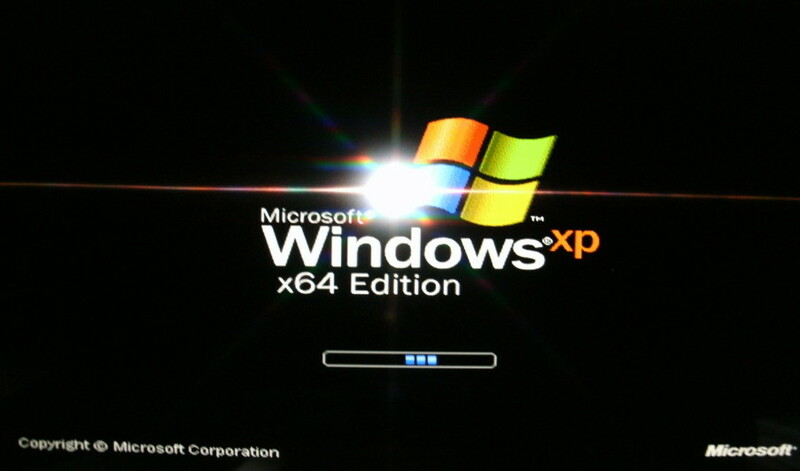 So the next test will be a new installation of XP x64 with hyper-threading enabled during OS installation. I ran a new test with hyperthreading enabled during OS installation, but to no effect: it remains that this driver/NVMe combination boots normally with hyperthreading disabled, but unreliably with hyperthreading enabled. "Windows Server 2003 does not have the functionality to detect hyperthreading processors and multicore processors." Sometimes I get the OS to boot normally with hyperthreading enabled by introducing some change in the BIOS settings (such as enabling Fast Boot), so in one such instance I took the opportunity to benchmark. 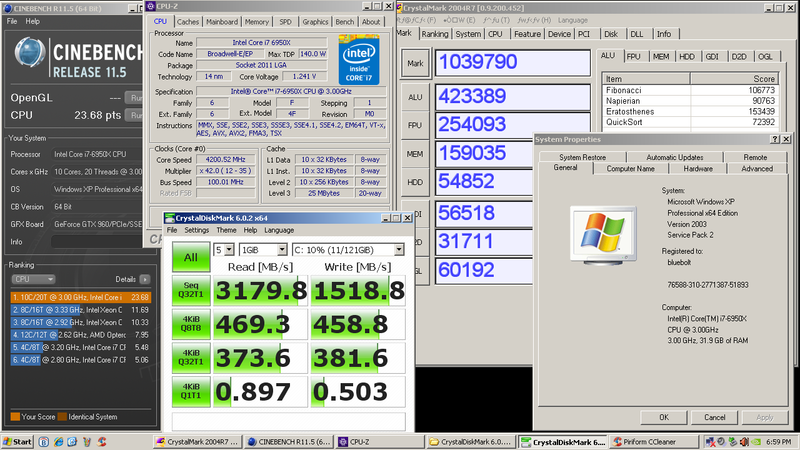 As usual, XP performed better with HT enabled; too bad it won't stick. I haven't been able to get a grip on the inconsistency--seems like with hyperthreading enabled it should either boot normally, or not. To be clear, the setup always boots--I have not experienced a single blue-screen or failed boot in weeks of testing. It's just a matter of whether hyperthread mode boots and runs at normal speed (which is to say, very fast), or hundreds of times slower. I hope to test a new setup with a different NVMe drive in a few weeks. The Samsung 970 NVMe drive is no longer available for testing, so I can't re-check that, but disabling Hardware Prefetcher has helped a lot. I plan to test a different NVMe drive in a week or two. The system now consistently boots timely: the solution was to enable Intel SpeedStep in the BIOS. I disable SpeedStep for Windows 2000 and am nonplussed that the combination of SpeedStep/Disabled and XP x64/NVMe would affect boot reliability, but it does in this setup. Disabling Hardware Prefetcher and Adjacent Line Prefetcher didn't sit well with me because of the performance hit it caused, so it's nice to be able to run with those features enabled now. Current tests are with the Intel 760p Series 1TB NVMe (SSDPEKKW010T8X1). Default voltage for the i7-6950x CPU is 0.976 V. This motherboard has integrated overclock settings up to 4.0 GHz, at which ASRock sets voltage at 1.241 V (according to CPU-Z). I was able to manually raise the clock to 4.3 with no other changes, and low temps. So it seemed a couple of more clicks would be easily attainable with increased voltage, but alas (in my admittedly limited testing), 4.3 was a hard wall.